The Energy Institute of Alabama is proud today and every day of the men and women who work on the front lines ensuring that Alabamians have reliable electricity. Whether engaged in routine installation and maintenance or restoring electrical service in the wake of a storm, linemen leave their homes and families and work until every customer has power. EIA officials today announced the creation of a vehicle tag honoring this group of unsung heroes. The Thank a Lineman tag was officially unveiled to the public at the Lineman Appreciation Day celebration at the Alabama Power Company Gunter Park Crew Headquarters. “I am delighted to announce the creation of the Thank a Linemantag, which recognizes a group of people who work through good weather and bad to ensure that we have the electricity needed to enjoy our everyday activities,” Hammett said. “Our hopes are that proceeds from the sale of the tag will benefit 501(c)(3) charities that support linemen, utility workers and their families,” said Blake Hardwich, EIA executive director. Those wanting to purchase the specialty tag may do so by visiting the Alabama Department of Revenue Website at https://precommit.mvtrip.alabama.gov. In honor of the utility professionals that go above and beyond, EIA representatives presented the organization’s first Outstanding Service Award to not one, but three exceptional individuals. In the aftermath of Hurricane Irma last September, Baldwin EMC’s Kevin Dorman and Louis Ruffin were working 16-hour shifts near Gainesville, Fla., helping Clay Electric Cooperative restore power to its members. Baldwin EMC Vice President Jody Taylor learned that a resident of the affected area, 74-year-old Carol Grozier, had been without power for three days. More importantly, she had been without power for her medically prescribed oxygen concentrator. Taylor located Dorman and Ruffin’s Baldwin EMC truck nearby and the two linemen installed a life-saving generator to power the oxygen concentrator until electrical service could be restored a few days later. The actions of Taylor, Dorman, and Ruffin likely prevented a medical emergency for Grozier. 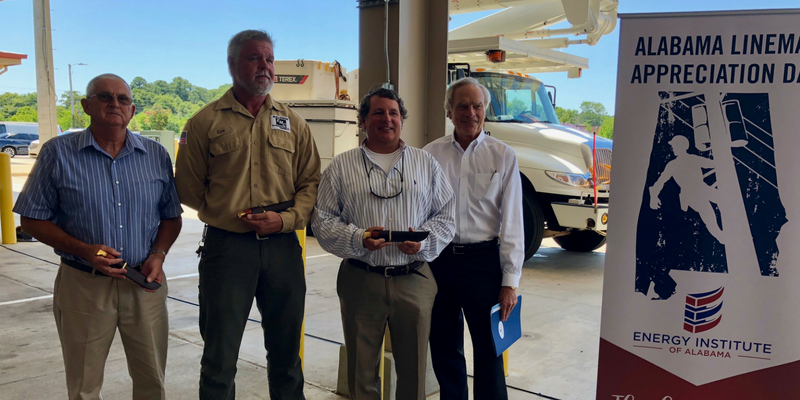 For their willingness to provide emergency assistance and commitment to their profession, the Energy Institute of Alabama awarded its Outstanding Service Award to Kevin Dorman, Louis Ruffin and Jody Taylor of the Baldwin EMC. “As we recognize the heroic acts of these three selfless individuals, it is important to honor all linemen for their contributions and bravery,” said Hammett.